For a variety of reasons including pregnancy, family history, hormonal changes, age, trauma, prior blood clots, obesity, and inactivity, patients can develop unsightly spider and varicose veins appearing commonly on the legs. These veins can range from small spider veins all the way to large, twisted, ropey veins and everything in-between. 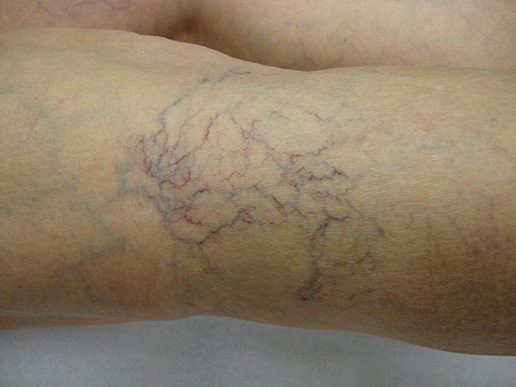 Not only can the visual appearance of the legs be unacceptable, but most patients with varicose veins have symptoms which may include leg pain, achiness, fatigue, nocturnal cramping, itchy skin, swelling of the legs, tenderness of the veins, darkening or inflammation of the skin, induration of the skin, and in severe cases, ulceration of the skin. With these symptoms, the problem is no longer just cosmetic and likely there is physiological dysfunction of the leg venous system that requires medical attention. A variety of treatment options may be recommended depending on the size of the problem veins. These options include compression stockings, ultrasound- guided and direct visual sclerotherapy, and endovenous laser ablation. Part of deciding on treatment options requires a thorough history and physical exam. The current standard of care requires assessment with duplex ultrasound imaging to delineate the venous anatomy and determine where the veins are abnormal. Without this information when assessing varicose vein patients, proper treatment recommendations cannot be made. At an initial consultation, Dr. Mah carefully assesses each patient with ultrasound mapping of the leg venous system to determine that individual’s optimal treatment plan.